My husband hates this monstrosity. He is only going along with my romantic idealism that having a rain barrel makes me a conservationist so I don’t bother him about buying more signage for his man cave (seriously, that’s another story all together). He drilled a hole into one of our gutters and now this massive barrel sits in wait for me to fill up my watering can seven times (yes, I counted) to water every single potted plant and herb in our yard every day. It would be much easier to use the hose, but I am stubborn and want to prove to my neighbors (a.k.a my in-laws) and my friends that I’m not just taking up valuable deck space with this thing but actually benefitting the earth. As I do this routine each night I offer B to hold the can and pour the water (you know, teach him how things grow). He was into it the first week or so, but two months in, he’s OUT. I’m beginning to wish I had just stuck with my original plan of paving my entire yard. I am hating my plants right now. They are so needy. I even had to beg someone to come over and water them when we went away for the weekend. I secretly hoped the person would forget and they would all die and I could be released of my nightly obligation. Why can’t I commune with nature? I want to be “earthy”, but I’d rather be doing almost ANYTHING else. I’m beginning to see the allure if that green grasslike indoor /outdoor carpeting. Am I losing my mind? 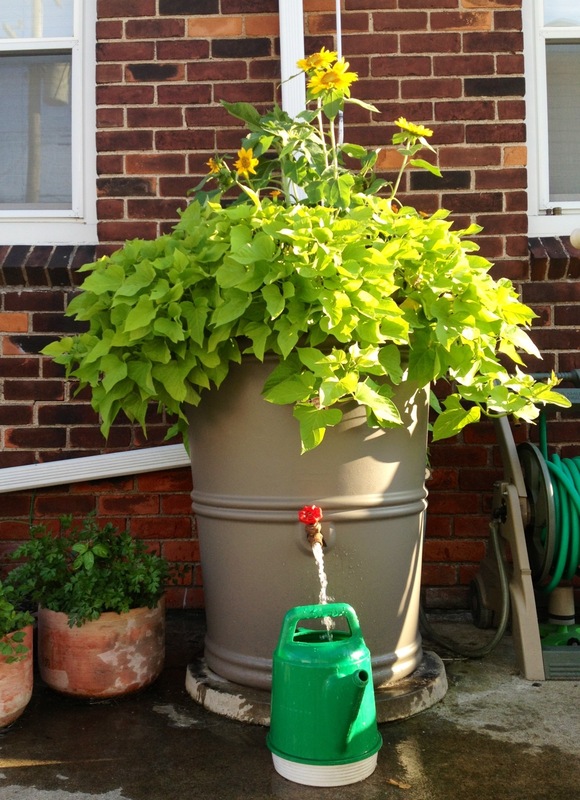 This entry was posted in At Home and tagged gardening, rain barrel, toddler, water conservation. Bookmark the permalink. No. But. oh gawd, the number of great ideas and perfect proposals for the natural family life I once dreamed of have gone down the sink like so much dishwater. Now, I’m a realist. Aspire and dream but don’t give yourself a hard time. Poor plants still suffer under my care but the family seem to be thriving. Haha I feel your pain. Gardening is not my thing and I would hate having to do that every night! Well, I admire your tenacity, but you really need to do whatever your heart feels happy with. If it’s not gardening, then I say chuck it! Find plants that can deal with whatever rain comes their way naturally. Yes, next year I’m chucking the idea. But for now I feel compelled to help the plants fulfill their life cycle… I can’t let them die until the weather turns cold 🙂 Here’s hoping for an early frost! Oh my goodness, that must be a proverb because it is SO TRUE! !